German actress Diane Kruger garnered widespread attention while portraying the legendary, seductive Helen in the box-office epic Troy (2004, starring Eric Bana, Brad Pitt and Orlando Bloom). She continued to grace the silver screen with her roles in 2004’s Wicker Park, National Treasure, and 2005’s Joyeux Noël (a.k.a. Merry Christmas). She will soon complete her upcoming films, Copying Beethoven and Les Brigades du tigre. The blonde-haired, blue-eyed, 5' 8" tall German beauty was a former model and a finalist in Elite's 1992 “Look of the Year” competition. Measuring 33 1/2-23-34 ½, Diane Kruger was listed as one of People Magazine’s “50 Most Beautiful People in the World” in 2004. She is married to French actor Guillaume Canet. In Hildesheim, Germany, Diane Heidkrueger was born on July 15, 1976, to parents Hans-Heinrich (was a printer) and Maria-Theresia (was working for a bank). She also has one younger brother, Stefan. Hoping to become a professional ballet dancer, Diane studied at the Royal Ballet in London at the age of 11. However, an injury ended her dance career and Diane returned to Germany, where she became a top fashion model. She later relocated to Paris to pursue a career in acting. On September 1, 2001, Diane Kruger married French actor Guillaume Canet (born on April 10, 1973; famous for acting opposite Leonardo DiCaprio in the film The Beach, 2000). The couple resides in Paris, but lives separately. 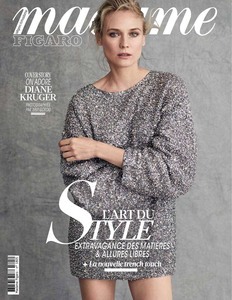 Following an injury that ended her dance career, Diane Kruger returned to her homeland Germany to become a model. At age 15, she was a finalist in Elite's 1992 “Look of the Year” competition and scored a deal with the top modeling agency. Soon after, she became a top fashion model in Germany and worked for such prestigious fashion houses as Dior, Yves Saint Lauren, Jil Sander and Armani. Kruger also began taking acting classes in Paris and New York and auditioned for a part in Luc Besson’s The Fifth Element (1997). In 2002, Kruger debuted, opposite Dennis Hopper and Christopher Lambert, in Jean-Pierre Roux’s The Piano Player (a.k.a. The Target), a tale about the relationship between a businessman and his gangster bodyguard. That same year, Kruger joined in husband Guillaume Canet-directed film, Mon Idole (a.k.a. My Idol, or Whatever You Say). In the dark comedy movie, about a Jerry Springer-like talk show host, Kruger starred as Clara, the wife of the show’s producer (played by François Berléand) who is also involved romantically with the host (played by husband Guillaume Canet). Later that year, Kruger appeared in New York University graduate director Cedric Klapisch’s Ni Pour Ni Contra (a.k.a. Not For or Against, starring Marie Gillain) and starred as Julie Wood in Louis-Pascal Couvelaire’s big screen version of a popular French comic strip from the 1950’s, Michel Vaillant (alongside Sagamore Stévenin). Kruger enjoyed her prominence when German filmmaker Wolfgang Petersen handed her the role of Helen (Queen of Sparta), who left her husband King Menelaus (played by Brendan Gleeson) for the Prince of Troy (played by Orlando Bloom), in the adaptation of Homer's great epic, Troy (2004, a.k.a. Trojan War, also starring Brad Pitt and Eric Bana). Being asked about her role in the film, Kruger described, "Her beauty didn't do her any good and she couldn't use it in any positive way or manipulative way.” She added, "It was something strange for me, to kiss Orlando. I was so embarrassed! It is not as fun as people think to shoot love scenes. You feel vulnerable, and there are about 100 people looking at you." Following her big screen breakthrough, Kruger received more acting jobs. She portrayed Josh Hartnett’s long-lost love Lisa in Paul McGuigan's remake of the 1996 French film L’Appartement, Wicker Park (also with Rose Byrne and Matthew Lillard) and costarred as the alluring, but unwitting, National Archives conservator Abigail Chase in Jon Turteltaub's adventure National Treasure (opposite Nicolas Cage, Harvey Keitel and Sean Bean, both in 2004). She also returned to France to team with husband Guillaume Canet in directors Tristan Aurouet and Gilles Lellouche's comedy Narco (2004) and in writer-director Christian Carion's Joyeux Noël (2005, a.k.a. Merry Christmas), a heart-warming story based on the events that occurred on a Christmas Eve during World War I, in which Kruger starred as Nikolaus Sprink’s (played by Benno Fürmann) soprano wife Anna Sörensen. More recently, Kruger played the title role of Frankie (2005) in writer-director Fabienne Berthaud's film with the same name. She will soon be seen in Agnieszka Holland's fictionalized account of the last year of Beethoven's life, Copying Beethoven (starring Joe Anderson), and in director Jérôme Cornuau's take on the hit French action television series, Les Brigades du tigre (with Clovis Cornillac, Edouard Baer and Olivier Gourmet).